This spring and summer there have been a few articles in the local media about whether Seattle has too many farmers markets. Rebekah Denn wrote about the question in Seattle Magazine, the online P-I just posted an article last week. Back in February, King County’s agriculture department produced a whole report about the future of farmers markets in the County, which I recommend to anyone who is interested in this topic. It’s long, but very readable, and gives a much more complete picture of the challenges faced by the farmers market movement than the articles and blog posts I’ve read. 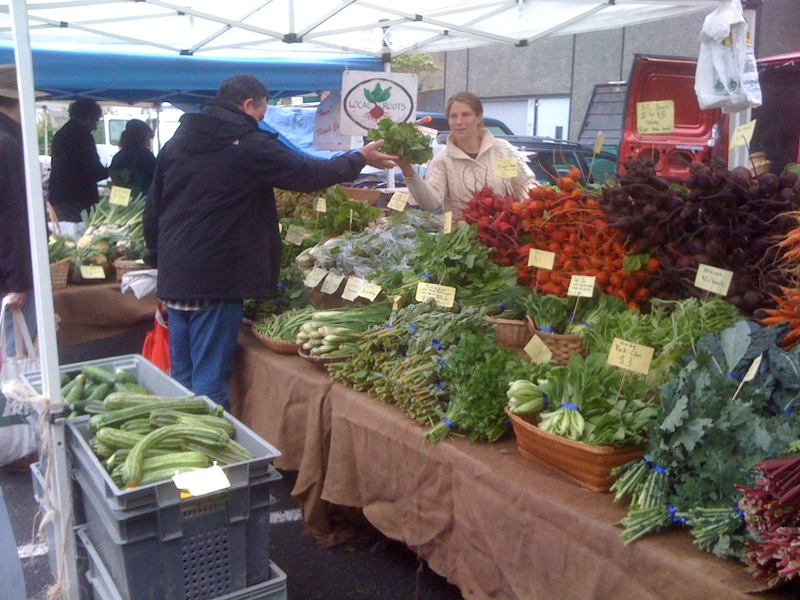 It’s true – there are a LOT of farmers markets in Seattle, at least 17 that I am aware of. This year, two new markets started up in the Olympic Sculpture Park and in the Georgetown neighborhood. Last season, the Pike Place market started operating two satellite markets, one in the Cascade neighborhood (South Lake Union) and one downtown at City Hall. On the blog for the Cascade market, the most recent post is a plea to the neighborhood to support the market so that the vendors will continue coming… not a good sign. Are there too many farmers markets? Is this trend really a problem? I think the answer to this question depends on who you are within the farmers market system: farmer, shopper, market organizer, local food advocate… even within the group of farmers who sell at markets, the answer will probably vary. 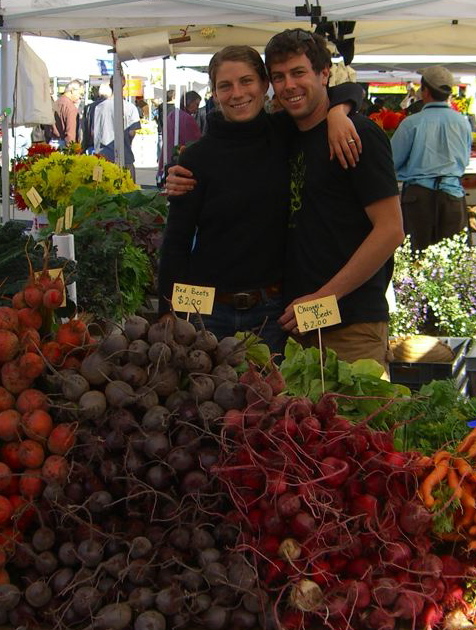 Well established growers with stall space at the most lucrative Seattle markets have a different perspective on the issue than start-up farmers who are eager for any opportunity to get their produce into a market in Seattle and have the chance to connect with shoppers and build relationships. 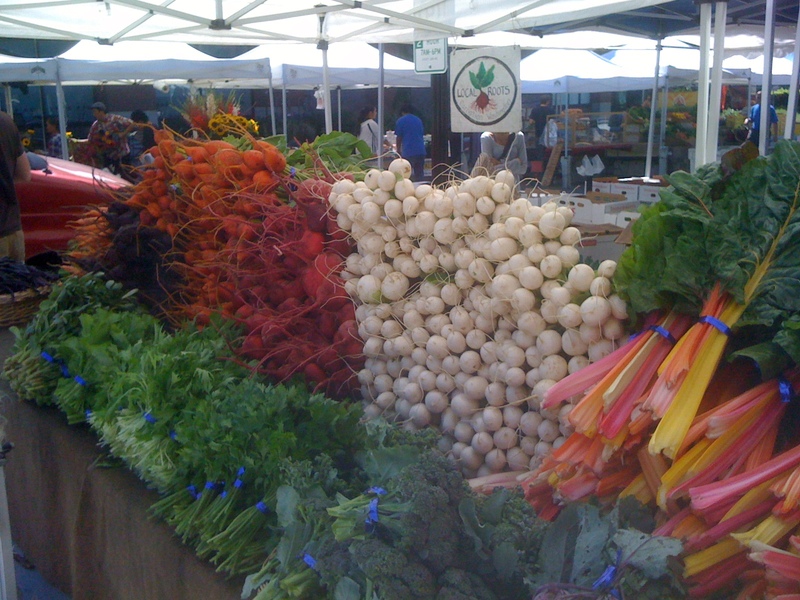 If you are a farmers market shopper, you might be happy to find a brand new market pop up in your neighborhood, but then disappointed by the small number of vendors, or you might notice that the same farm you buy from at the Ballard market has less variety or maybe lower quality produce at a smaller, weeknight market. In any case, there’s no easy answer. All I really know about is what we do on our farm. We attend three farmers markets a week, and over the last four years, we have participated in six different neighborhood markets and worked with three different market organizers. We’re still pretty new to the farmers market scene in Seattle, but we have built strong relationships with our customers at the Broadway and Queen Anne farmers markets over the four years we’ve been here. 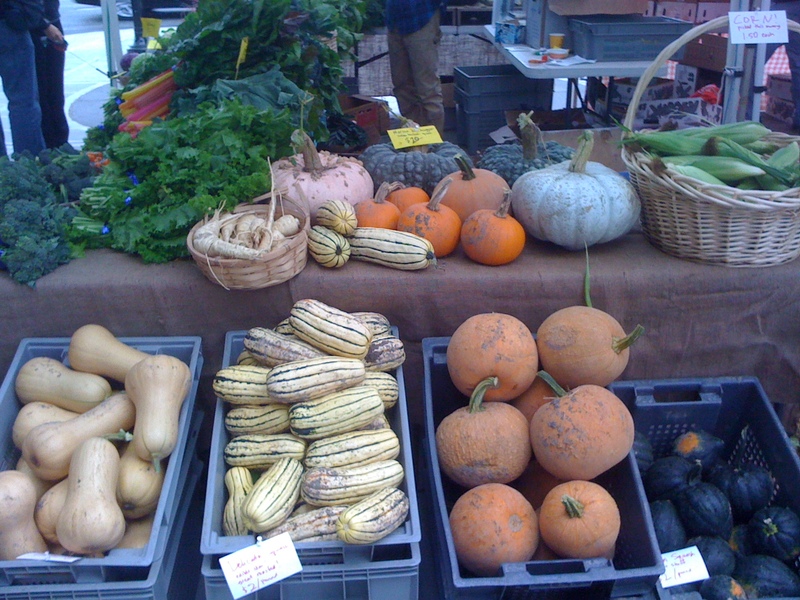 Farmers markets are only one part of our business model. We also have a 100 member Community Supported Agriculture program, we sell produce to about 15 of Seattle’s best restaurants, and we wholesale some of our crops to Central Co-op’s Madison Market. Each of these marketing channels has unique costs and benefits, but together, they form a business model that works well for our farm and our personal strengths and interests. Our personal favorites - the "weird Italian vegetables"
That being said, farmers markets are by far the least economically efficient way that we sell produce. To begin with, they require a large number of hours to be spent off the farm. For each four-hour long farmers market, we spend about an hour on each end setting up and breaking down our stall, plus an additional hour on each end driving to and from the farm. That adds up to eight hours away from the farm, and we almost always have two people staffing the market, so it’s really a total of 16 hours. 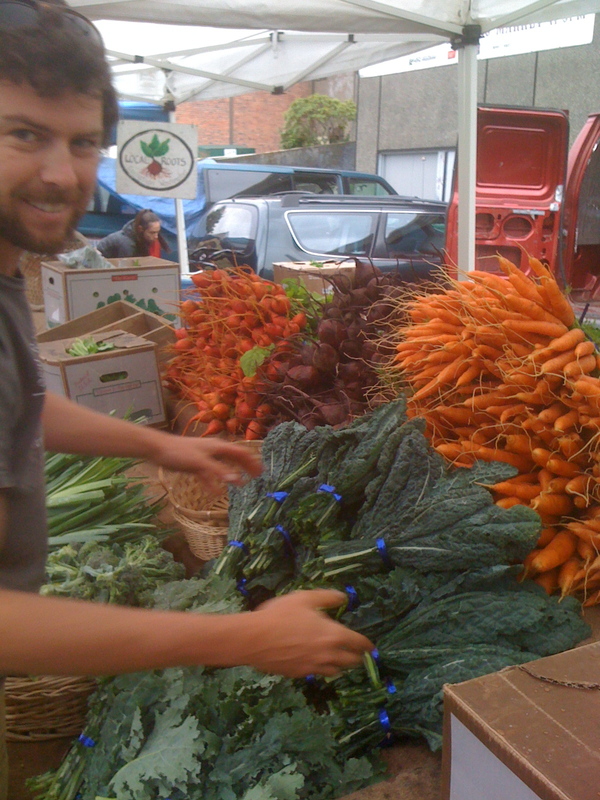 To make a comparable amount of money selling to restaurants or through our CSA, it takes one person about four or five hours to drive the van from the farm into Seattle and make all the deliveries. Add another hour for the return trip, and the difference between a market and a delivery day is equal to one whole day’s worth of work on the farm. Even if there wasn’t always way more work to do than time available to do it, that extra day could be spent doing all the things that non-farmers get to do: go for a hike, catch up on sleep, visit friends and family. We don’t do any of that stuff. Now, even with all those counts against them, farmers market will likely continue to be an important part of our business model. They are also the most fun thing that Jason and I do every week. Farmers markets give us instant gratification. The people who love to eat our food are there, telling us how much they enjoyed the peas or the lettuce they bought last week; the random passers-by always exclaim about the color of our Rainbow chard; the other vendors are friends of ours, plus they give us bread and fruit in exchange for our extra salad greens. The advice we give every week on how to prepare and cook our produce has made a difference in the eating habits of dozens of Seattle households, and that makes me feel really, really good about what we’re doing. We’ve found a niche at our two favorite markets that is both profitable for our farm, and good for our psyches, and we want to stay there. On the other hand, we know that average sales for farmers market vendors are on the decline, that many vendors are thinking of reducing the number of markets they attend, and that we ourselves have stopped participating in some markets because of slow sales. What makes a market a success, and is the sheer number of farmers markets in Seattle causing declining profitability for farmers? Sorry to pick on you again, Magnolia, but I’m going to use your Saturday farmers market as an example. We came to the Magnolia market for three weeks in July. I know, that’s not a very long time. There are lots of reasons why we stopped attending this market, but the big one was that we weren’t making any money – between $350-$45o each week, even though the weather was nice, we had lots of beautiful produce, and our booth was right near the market entrance. I’ve talked to other farmers who do this market, and I hear a similar story – there just aren’t enough shoppers at the market to support the number of vendors there. I suppose this imbalance was only made worse when we started coming to the market in early July, and possibly, when we left the market, the other produce vendors started doing a little better again. The classical economist would say that this free-market system will eventually achieve some kind of equilibrium, as farmers like us decide to drop out and vendors who are profitable at the market stay on. Of course, it doesn’t really work like that either. A small market that just has a few produce and flower farmers, a hot food vendor, and maybe some bread or cheese just might not be compelling enough to keep the neighborhood shoppers coming back each week. And without the shoppers coming back each week, eventually one or two of those vendors might decide they’d rather spend that day working on the farm than standing at a market. But what comes first, a diverse mix of vendors selling high quality produce, or a supportive, food-loving neighborhood that spends enough money each week to keep the market thriving? Does there have to be some kind of magic synchronicity, where a neighborhood is primed to support a market just at the same time that a number of new or expanding farms is ready to join a market? A good market manager who understands the neighborhood and anticipates the ebb or flow of the shopper demographic is also absolutely critical. My example for this is Molly Burke at Broadway, who has carefully nurtured the growth of the market over the last four years and deftly matched the number of vendors to the growing number of shoppers. Then there are the millions of intangible reasons why a market is successful. When we first started at the Broadway market, it was our least successful market. After each of our first two seasons, we strongly considered dropping out of the market and trying to find some other Sunday or Saturday market to take its place. Why did we stick with it? For one, it’s in our neighborhood. Jason and I live just a few blocks away, and we wanted to support “our” market in hopes that it would eventually get better. Also, our buddy Brent Olsen, who sells meat and potatoes at Broadway (and several other markets), kept telling us that he had a good feeling about Broadway, that he’d been there since it opened, and he thought the market was about to turn a corner. From the shopper’s side, what makes a market compelling? With so many markets to choose from, what draws someone back to the market each week – and more importantly, what makes that person buy enough food to keep us all in business? My example for this is the Queen Anne farmers market. This market almost disappeared after its first two years when the original market manager decided there wasn’t enough neighborhood support for a Thursday market. A group of neighbors rallied together and worked extremely hard to keep the market alive, and have been operating as an independent market now for almost two seasons. The market moved to a much more visible location, has gradually added new vendors, and puts on the best chef demos and events in the whole city. As a vendor, I can tell that there is a solid group of neighbors in Queen Anne that is dedicated to making this market succeed, and a high percentage of our customers each week are die-hard regulars. The farmers market is clearly an important weekly event for a lot of Queen Anne residents. They come to the market to see their neighbors, hear the musicians, get ice cream with their kids, drink a glass of wine at Pasta & Co., but it’s not just a social event. They also know that if they don’t support the farmers at the market, the market won’t thrive, and all those intangibles will be at risk. They’re making a conscious choice to spend their food dollars with us at the Queen Anne market instead of at the grocery store, or even at another of the nearby farmers markets. So, what is the secret to a farmers market’s success, and how do we know whether Seattle’s 17 weekly farmers markets are too many? Here’s one way to look at the second part of the question: King County’s farmers market report shows that farmers need to make at least $600 per day at a market for it to be worth their time. I’d say that seems a little low, but let’s use it in this example. If a typical market has 30 farmers, then the total dollars needed each week to support the market’s farmers would be $18,000. According to the Neighborhood Farmers Market Alliance, the average number of shoppers at their markets ranged, in 2009, from about 800 per day at Magnolia to 2,500 per day at the University District. 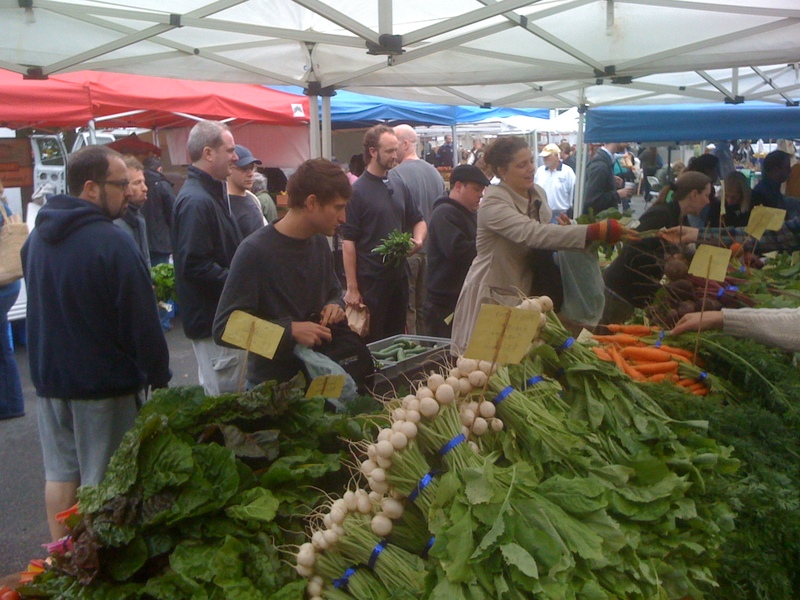 The Phinney market, where we sell on Fridays, averaged about 1,000 and Broadway averaged over 1,300. Let’s assume an average daily shopper attendance of 1000, just to make it easy. That would mean that each shopper at the market would have to spend about $15 each week to make it worth the farmers’ time to be at the market. For that to happen at all 17 markets, we’d need 17,000 Seattleites to spend $18/week (just during the market season, not year round). Or, we’d need 34,000 people to spend just $9/week. There are over 600,000 people in Seattle. I think we can probably support more farmers and farmers markets. Of course, there are many other issues that affect farmers markets and farmer success. When the average American family only spends $26 per week per person on food that they cook at home, spending $18 at the farmers market might seem like a lot. On the other hand, the USDA tells us that we should be spending about 40% of our food budget on fruits and vegetables (it’s in this report, for those of you who love statistics). 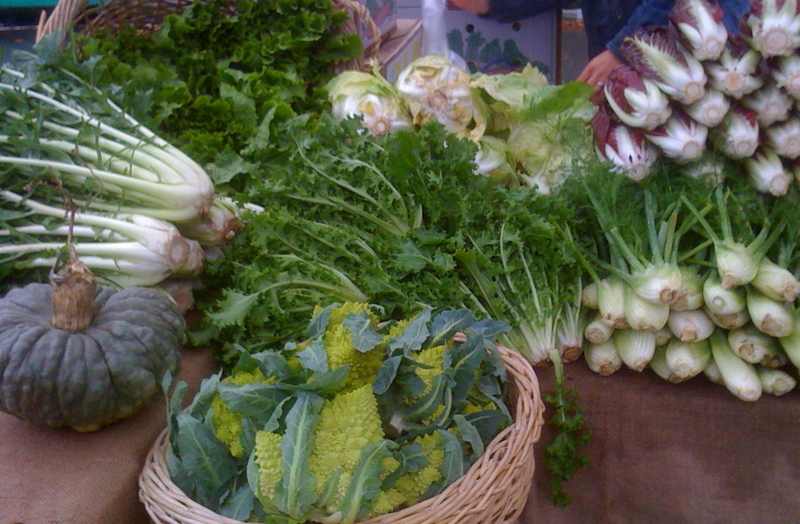 If the average family of 2.5 spends that 40% at the farmers market, that would be $26 per household each week. At our stand, $20 buys a pretty hefty bag of vegetables. Other barriers to farmers market success include (in)convenience, competition from cheap, subsidized commodity foods available at the supermarket, misperceptions about price and value of farmers market produce, and the fact that most of us don’t know how to cook. We’re working on all these problems. Give us a few more years, and we’ll see what we can do. Picking lettuce... one head at a time. It’s impossible for me to believe that the market for farmers’ markets is saturated when such a small percentage of our food dollars (last I heard it was 2 or 3 percent) is being spent in this venue. Despite the fact that this business model is so old, it’s actually very new and the challenge at this point is to tailor small neighborhood markets to specific neighborhood demands and demographics. There’s bound to be a learning curve, and I prefer to look at the challenges as opportunities rather than setbacks. Also, I know our businesses are very different, but Patty Pan has managed to carve out a niche at smaller markets by scaling back our operations and adjusting our expectations. It may not work for everyone, but most of the time it’s worked for us. Thanks for your perspective. I was drawn to this post because in our Canadian city of over 1,000,000 we’re seeing a surge in farmers’ markets and I’ve been hearing folks ask similar questions. Those, and what are mangos and limes doing at a Canadian farmers’ market! This is a pretty different than the story on the Alvarez Farms from last year (or the year before?) But they also farm at a different scale. It would be interesting to know if they have changed their feelings at all. As I recall, the markets were their best venue. FYI – our family of two spends most of our $ home cooking and never get out of the market spending less than $50 a week. Too much temptation. That is no prepared food, nor sweets. We will have to look for you at a new market (to us) one of these days soon. This is a fabulous post telling part of the story that romantics often forget. A couple of years ago I’d get my boys up early to go to the market and make them help the farmers set up. It was our way of them doing community service and realizing what hard work it is. That’s why I’m such a fan of CSA. I really admire your thoughts on this topic. Great explaination that I wish everyone would read. I volunteer at the Duvall market and feel like I have a grasp on what’s going on; just don’t know how to explain to others. Thanks for clarifying, in such great detail, so many questions for me about the economics of farmers markets. I’m a fan of farmers markets and try to support as many as possible. Recently, I’ve been struggling with the question of whether to increase that support and not signing up for my winter CSA, or continue supporting my farmer through the CSA. Sounds like the CSA probably works a lot better for him. Every farm’s situation is different. If you have a particular farm that you really like and want to support, just ask the farmer what is best for him. 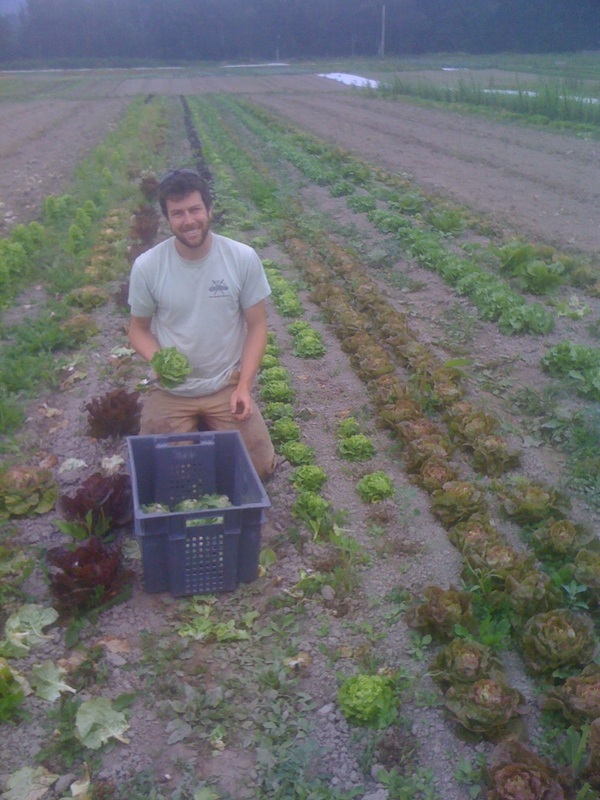 For us, the tradeoff between doing more markets or increasing our CSA will probably be different every year. We make the decision about how many CSA subscribers and how many markets to do in January, way before we plant the first seeds of the new season. In any given year factors like weather, changes at the farmers market, and lots of other things can sometimes make us wish we had planned things differently. We’re trying to find the right balance, and since every year is different, the balance is always shifting, at least a little. I wont travel far to go to many places so for people like me, There is not enough markets. I love them and each one has different things and quality. its great to have options and the more in a area will promote people to goto them rather than a grocery store. It will become common for people to shop at them if they are around more. I think its great and i hope we get more out in Spanaway/Puyallup area. Its a forgotten spot with ALOT of famlies who would shop there. The military is down the street. Any farmer looking for more customers should hit a corner out this way. There is atiny little 8 foot farmers market on 112th and Waller road. there is a sign that says SOLD OUT everyday even when you go by earlier and it was packed FULL!! We have stawberry vendors standing on corners in almost every neighborhood selling to people who will buy buy buy! Such an interesting perspective to read from where I sit (in a small town in Australia). I’ve just embarked on a blog to try and inform locals about what is produced in this area. The idea of too many farmers markets is an odd one to me! Rather, we need more growers and more markets. It sounds like you have great support from consumers in your corner of the country. I hope in the future, we are discussing the same issues over here.